Bodyguard star Richard Madden has spoken out against the “unrealistic” demands he and his fellow actors face regarding their weight and body image. “I’ve done numerous jobs where you’re told to lose weight and get to the gym,” he told British Vogue. His comments follow singer Sam Smith’s recent admission on Instagram that “I have starved myself for weeks” in advance of photo shoots. Smith’s revelation was accompanied by a shirtless photo that was described as an effort to “reclaim my body”. Madden said he and his actor friends had found themselves bemoaning the “barely eating, working-out-twice-a-day, no-carbing thing” required for certain scenes. Madden, whose other roles include Robb Stark in Game of Thrones and the Prince in Cinderella, said he had sometimes been given restrictive costumes that had made breathing difficult. The Scottish actor will next be seen in Rocketman, a musical biopic about Sir Elton John starring Taron Egerton. Madden is not alone in highlighting the pressures placed on the modern leading man. 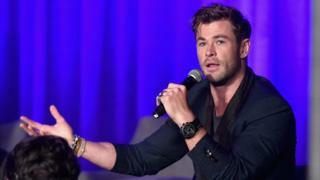 Last month, Australian actor Chris Hemsworth – soon to be seen reprising his Thor role in Avengers: Endgame – admitted keeping in shape for the camera “can start to become a drag”. “The roles I’ve taken on have shaped my physique,” he told Men’s Health. “It just goes hand in hand with the parts I play.